Suppose that an extended quantum system, e.g. one made of optically trapped cold atoms, is subjected to an abrupt change of the parameters of its Hamiltonian and, after that, evolves according to the unitary dynamics of the new Hamiltonian: does it thermalize or not? Will it have memory of its initial state? How does this thermalization occur? Is there a difference between integrable and non-integrable dynamics, as recent experiments seem to suggest? For integrable systems, what is the correct statistical ensemble that describes the infinite-time equilibrium situation? Is there any emergent universality? A whole lot of physics, as it emerges from the alluring fast developing field of quantum systems out of equilibrium, is calling for a proper analysis. 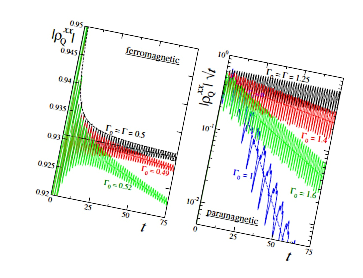 Developing a profound understanding of the connection between ergodicity, integrability and thermalization in quantum systems, and exploring the great interdisciplinary potentialities of this research area, is an important target of our research that deals with exactly solved lattice models, quantum spin chains, cold atom systems and quantum field theory. Particular emphasis is given to quantum integrable dynamics of such systems and its breaking. Advanced methods of analysis include Conformal Field Theory, Form Factors, Bethe Ansatz, Boundary Field Theory, Keldysh formalism, Random Matrices, Semi-classical Field Theories and Truncated Conformal Space Approach.